We recently had the chance to check out Mr. Smalls Theatre in pursuit of one of our favorite recent bands, Low Cut Connie during this leg of their US tour. This energetic band has garnered a large and faithful following with their unconventional and unrelenting style that is good enough to have attracted the attention of Elton John, Bruce Springsteen, and President Obama. Their music has a depth that has not been seen in the industry for many years. Countless music reviewers have named the band as the best touring act in the country, no small feat to achieve. Their music is old-time rock with heavy influence from 50s rock, mixed with blues, soul, punk, and more. The crowd interaction and energy of this band is practically unparalleled. The intimate layout of Mr. Smalls Theatre certainly aids in making this band even better. This is easily one of the most entertaining concerts I have ever attended. 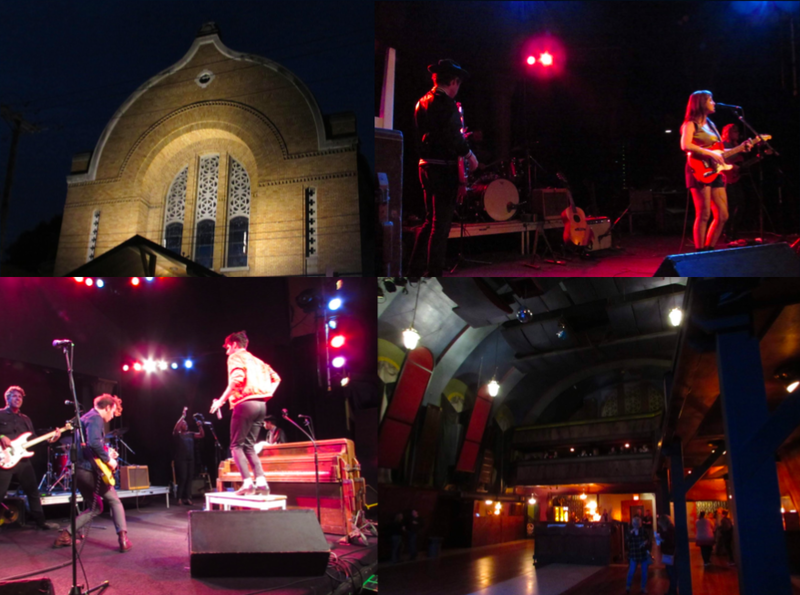 Mr. Smalls has become the premier concert facility and home to the music scene in the Pittsburgh region. Mr. Smalls Theatre is located within the former St. Ann's Catholic Church in Millvale, just across the Allegheny River from Pittsburgh proper. Building it was a labor of love and the results of which are perfect. We arrived about an hour before the concert and opted to grab some food in their cafe. They have a decent food, drink, and coffee selection. Their gourmet coffee is especially excellent. Here is a view looking back upon the space. The lower level is general admission and standing room only. It also has two bars. There are two balconies that offer club seating and another restaurant and bar area. The seating up there is available as an upgrade with any ticket for between 20 and 30 dollars, depending upon the show. The upgrade is directly deductible off of food and drink tabs, which is certainly a great value. We are huge fans of the band though and wanted to be right at the stage. They had two excellent opening bands, with one decent rock/rap band in &More. This Philly based band has an excellent mix of rock and hip-hop in their style, with an uplifting and positive message. Their performance was very enjoyable and it should be exciting to watch their growth. The second opening act, Ruby Boots, was definitely pretty unique. They are certainly rock driven, with a folk and country music influence. Their lead singer immigrated to Nashville from Australia and they certainly have an enjoyable vibe to them that feels like a more spirited incarnation of Bonnie Raitt. Her voice really carries the band and it will be great to see them progress. These guys are just great. Pure energy and excitement with every song. We first saw and heard them at Bethlehem's Musikfest in 2016, closing out the night at Volksplatz, and we were hooked. The best artists to compare them to are Jerry Lee Lewis and Chuck Berry, meets the raw energy of Motley Crue. There is no other band that is quite like them and they are really amazing and strange. A combination that makes their live shows simply incredible. Their stage presence is simply incredible. Throughout the entire show, Adam danced on every part of his piano, and throughout most of the entire venue, and really played his heart out and probably interacted with just about everyone in the room. His band was awesome as well. The interaction this band has with the audience really takes advantage of the intimate setting of Mr. Smalls Theatre. Overall, we highly recommend checking out this excellent venue. For more information on upcoming shows, eating at their cafe, using their recording studio, and more, check out their website at https://mrsmalls.com Nearby in Millvale, we highly recommend stopping to try out the Grist House Craft Brewery, which offers some of the finest brews in the Pittsburgh area. Perhaps the nicest and most exciting drama in nature is seeing the Pennsylvania's Elk Herd during their rut. Watching the groups of elk graze, and the bulls fight over mates, is extremely exciting and exhilarating. The scenery in the area alone is worth a trip though, especially in autumn. The beauty of the outdoors is on full display in this region, and seeing the grazing elk is a wonderful plus to that. We started with a stop at the Marion Brooks Reserve in the Moshannon State Forest and the Quehanna Wild Area. It is home to a spectacular stand of white birches, one of the most noted groves in this region of the country. They are neat to see in any season, but we missed the color this year on them, since they change and drop earlier than most of the tree species in Pennsylvania. The Bennett Branch of the Sinnemahoning Creek could easily be classified as a small river. The scenery along it is spectacular, and is even better when you see elk within the creek, like we did last year. Now we head over towards Benezette and the Winslow Hill Area. A group of elk. These creatures are majestic and stunning to see. The best time to see the most of them is as sunset begins to approach and at dusk. They get more active, and during the rut you will see different groups of them start to clash, with the bull elk charging each other and locking antlers, with the relentless and unmistakeable sounds of bugling and clashing antlers. It is truly exhilarating to experience. It is mesmerizing watching their graceful moves as they graze. Our next stop takes us up to the Elk Country Visitor's Center, where they have a interpretive center museum covering the species of the region and the history of Pennsylvania's elk herd. We had a nice lunch of beef brisket and fries from the Benezette Hotel's food wagon, which has high quality and affordable food. Some elk were in the woods at the center. Spectacular views like this one can be seen from the property at the Elk Country Visitor Center, which sits atop a hill. You do not always see elk at the center, but it is worth a stop to learn more about the species. On our first visit to the center, about 6 years ago, the fields surrounding the center were covered with a huge herd of elk. On this visit, we saw about 10 of them scattered about in the woods at the visitor center. Within a 10 mile radius or so, we easily saw hundreds of elk. The maples approaching full color. Brit took these shots on my camera at the visitor center. I love the detail on the tree in this shot. This view was taken just beyond Winslow Hill at the Woodring Farm Area. This is property was recently made public for elk viewing and it offers an excellent little hike into elk grazing areas. Two young bulls were resting in the field, surely getting their energy up for their fighting later. We did not see any elk at the Dent's Run Overlook on this visit, but the views alone are worth checking out. There were no elk at the Hick's Run Viewing area, but this view of the Sinnemehoning Creek Valley was more than worth a stop. Now we head to the other side of the creek from Benezette. In recent years they have added new areas for elk viewing, and this year they added a new parking area that is not intrusive and allows for more access. We saw at least 50 or more elk in this spot on this particular trip. This was also the most fruitful spot on our last few visits, including on our last visit in the winter, and our last fall visit. A bull in the middle of a bugle call. Several elk relaxing and eating. While the bulls bugle and prepare to fight other approaching bulls. As I look at these photos, I am reminded of the plethora of sounds and the feeling of dew settling and crisp autumn air. Two groups of elk meeting up. The approaching elk were in the midst of running. The only two elk that were aggressive at this point were these two bulls, which were locking antlers. And a closing view at sunset of the Bennett Branch of the Sinnemahoning Creek. There is something truly magical about this region and we highly recommend checking it out. The best time to see elk is in the hours approaching sunset, and into dusk.